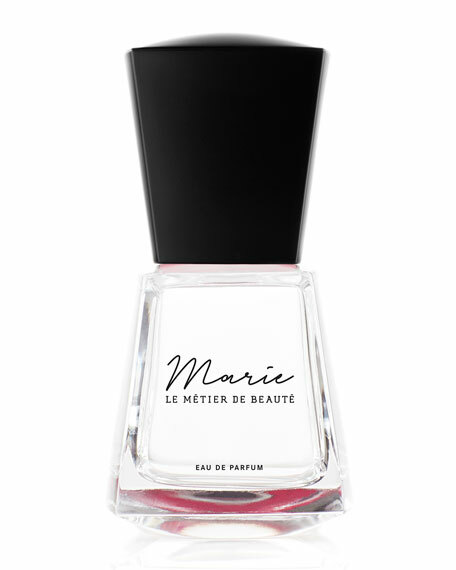 With an unwavering commitment to craftsmanship, Le Métier de Beauté now imparts its artisanal approach to beauty into the fragrance world with the launch of Marie, the brands first olfactory presentation. Marie is inspired by the gardens of Versailles, specifically the gardens surrounding the Petit Trianon, where it is documented that Marie Antoinette would escape to shake off the burdens of her royalty. The inspiration, an 18th Century French Garden, with all of its complexities, global aspirations and feminine allure, led Le Métier de Beauté to develop Marie. Designed as a feminine, complex fragrance with a modern day Marie Antoinette in mind, Marie embodies today's dazzling, confident Renaissance woman. She travels the world, fully connected, friend to many, enjoying lavish dinner parties, dancing into the night. She's also the woman to find solace and pleasure in unwinding under a tree, fully absorbed in a great book; intense in all that she does. Inspired by this love of life, and love of self, Le Métier de Beauté Founder Richard Blanch set out to bottle this joie de vivre with Marie. That he did as he and his Le Métier de Beauté team collaborated with leading perfumers to bring this vision of Marie to life. Working through scents that deliver a message of confidence and traditional femininity yet modernized through fragrance alchemy, Marie is the perfect woody-floral perfume. Marie features top notes of Toulousian Violets, Gloire de Dijon Roses and Cognac essence of Sheer Wood Accord and bottom notes of Cedar and Silky Musk. For in-store inquiries, use sku #2495617.